Jordan Gaytan graduated from University of the Pacific with a degree in business administration and a concentration in business law. In 2012 he received his Juris Doctor from the University of San Diego School of Law. He was admitted to the California State Bar in 2012. 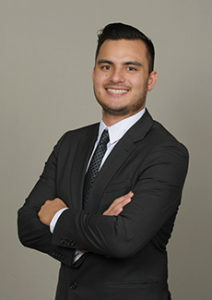 While at University of San Diego School of Law, Mr. Gaytan completed a legal internship with San Francisco Superior Court and won the inaugural Leonard Armato Entrepreneurial Scholarship in 2011. After law school, he volunteered as an attorney working for the California attorney general in the Bureau of Medi-Cal Fraud and Elder Abuse. Mr. Gaytan then went on to employment as a claims professional with a prominent, nation-wide workers’ compensation insurance carrier prior to beginning his practice as a defense attorney. Jordan Gaytan has been practicing workers’ compensation defense since 2013, joining Dietz, Gilmor & Chazen in 2017. He represents employers, insurance carriers, third-party administrators and self-insured employers in all areas of workers’ compensation law. Mr. Gaytan has a passion for litigation, aggressive defense and exposure reduction strategies. Mr. Gaytan likes to remain active, taking fitness and cycling classes. He is an avid concert goer and enjoys listening to live music performances.